This past week, I had the pleasure of attending the fourth annual That Conference in Wisconsin Dells. Something I’ve always admired about this particular developers’ conference is its Open Spaces concept. The abundance of bacon-wrapped cuisine comes in a close second place. What is an Open Space, you ask? 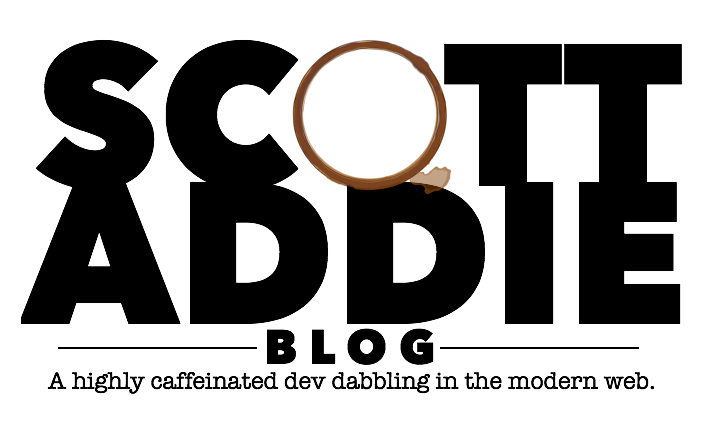 In a nutshell, attendees are given the opportunity to create hour-long, ad hoc sessions on topics of their choosing to engage with other attendees. 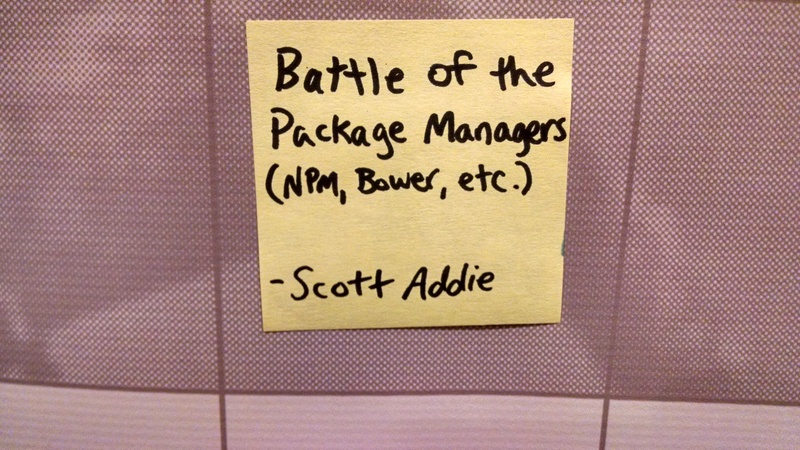 Since the volatile package management landscape is a personal topic of interest, I proposed a “Battle of the Package Managers” session; and, there was one takeaway that resonated afterwards. There is a great deal of uncertainty amongst NPM users on Windows who have encountered the 260-character path length limitation. This limitation stems from the Windows API’s MAX_PATH constraint. My goal with this blog post is to advocate practical solutions to the problem, but let’s first set the stage with a bit of background. A quick look at the screenshots below proves that the maximum file path limitation is likely to be exceeded, due to NPM’s nesting of dependencies. There are 1,039 folders total within node_modules. 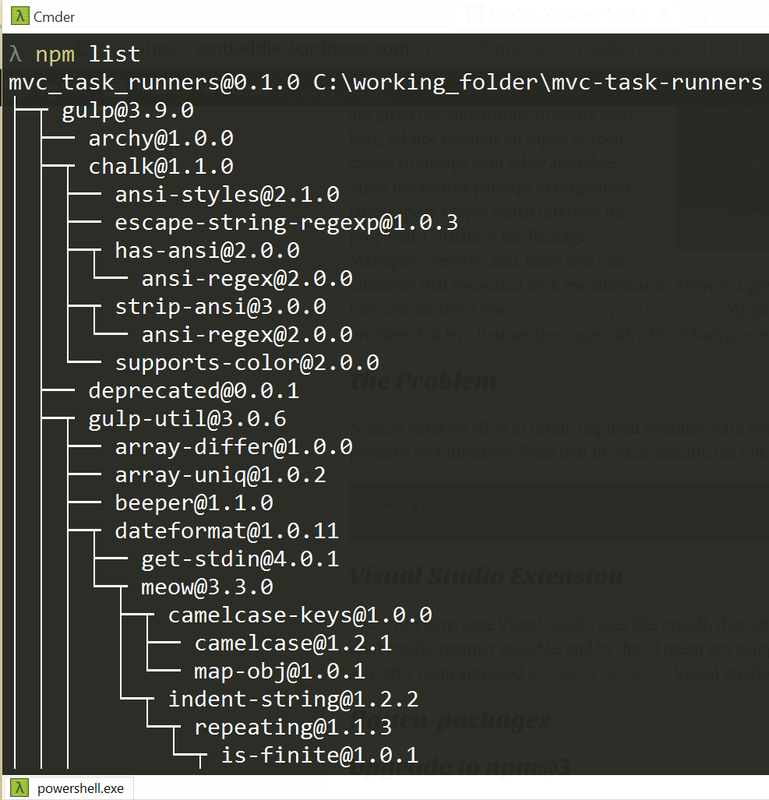 Keep in mind that NPM 2.x is being used in this example. As a Windows user, what are your options to mitigate this problem? Below are 3 possibilities. If you’re a long-time Visual Studio user like myself, then you’ve been spoiled. The IDE abstracts away the intricacies of several development tools and technologies, thus maximizing productivity and allowing developers to focus on tackling the problems surfacing in their business domain. You want to wrangle this issue with the least amount of friction possible; and by that, I mean not using the command line. Luckily, Mads Kristensen of the ASP.NET team authored a “Flatten Packages” Visual Studio extension which is compatible with 2012 – 2015. 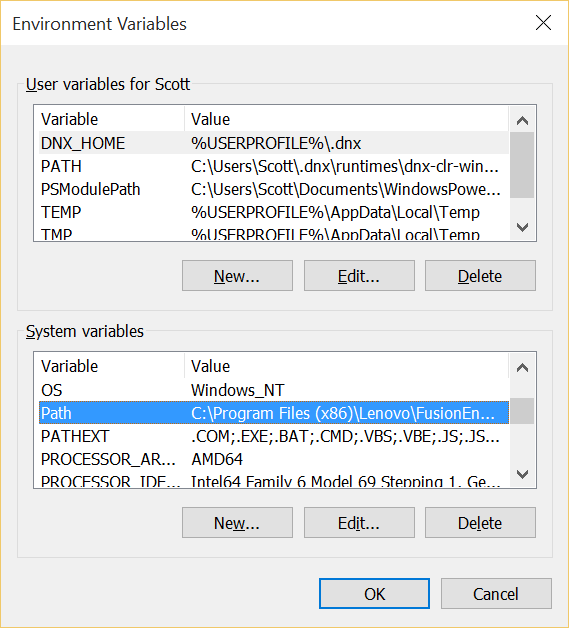 In Visual Studio 2015, you see a nice Dependencies node in Solution Explorer. It’s under here that the NPM modules will be listed. From the Solution Explorer tab, click the “Show All Files” icon for the web project containing the node_modules directory. Unfortunately, you cannot run Mads’ extension against the Dependencies/NPM folder; instead, right-click the now visible node_modules directory, and select “Flatten Packages…”. Alternatively, you can right-click the package.json file and will see the same context menu option. The first time running this extension, the dialog below will appear. Don’t be alarmed! 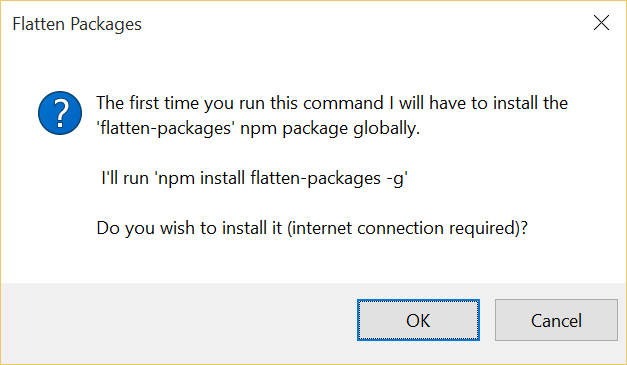 It’s indicating that there’s a dependent NPM module called “flatten-packages” which must be installed at the system level. 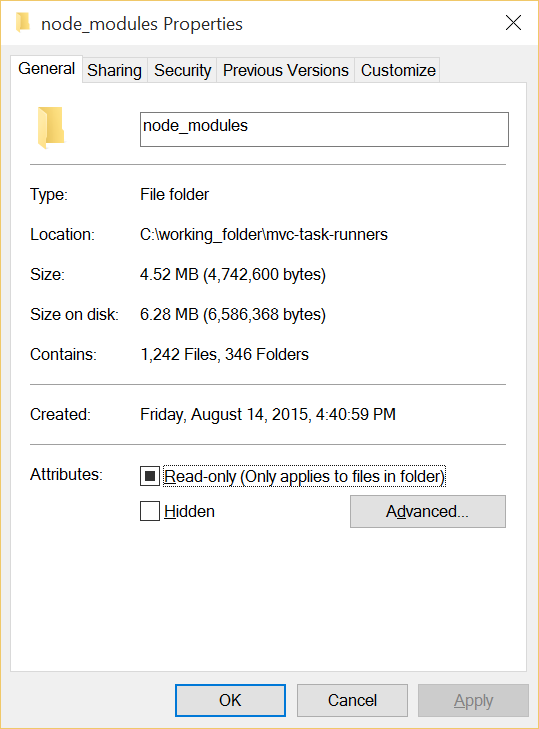 Click OK.
After the flattening process has completed, only 346 folders exist within node_modules. That’s a 66% decrease, and Windows is delighted to host this directory structure. There is no dependency nesting whatsoever. A quick look at the resulting folder size and dependency tree proves that the Visual Studio extension yields the same results as this manual approach. In other words, the extension takes the same actions behind the scenes. After changing your “Path” variable, close the command prompt, open it again, and check your NPM version number again with the npm -v command. This time around, you should see that version 3.x is being used. 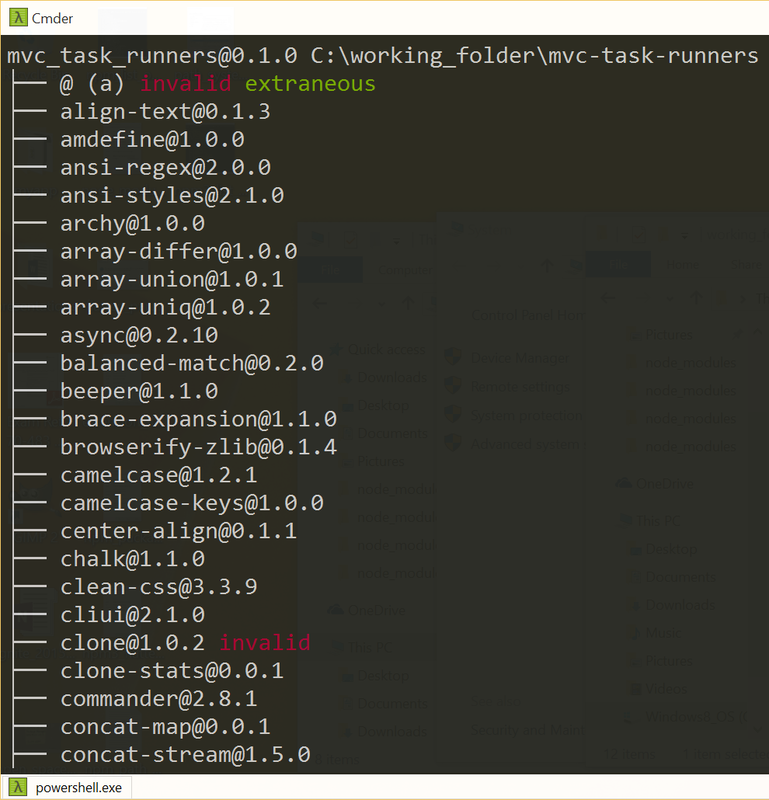 After running an npm install command to install the necessary dependencies, it’s clear that the folder size is a drastic improvement over npm@2. There is a 56% decrease in the number of folders. Although that’s 10% worse than using the “flatten-packages” option, I’d much prefer this route. It is native NPM functionality rather than a “plugin”. This is far from an exhaustive list of possible solutions. These are merely 3 solutions which I’ve used on past project work. It is my opinion that Windows NPM users are in a tough spot at this time; however, the situation is widely recognized across the industry and is slowly improving. We need your help to find and fix its remaining bugs. It’s a significant rewrite, so we are sure there still significant bugs remaining. So do us a solid and deploy it in non-critical CI environments and for day-to-day use, but maybe don’t use it for production maintenance or frontline continuous deployment just yet. There isn’t a bulletproof solution available. As with anything else, the moral of the story is to proceed with caution. What are some other solutions that have worked for you? I’m anxious to hear feedback on this topic. My work around has been to hide the node_modules folder from visual studio (to increase performance – stopping the intellisense caching). And “Long Path Eraser” to delete the folder when scrubbing. Long Path Tool will definitely help you. Please use this software and solve your computer, copy, delete, long path files. 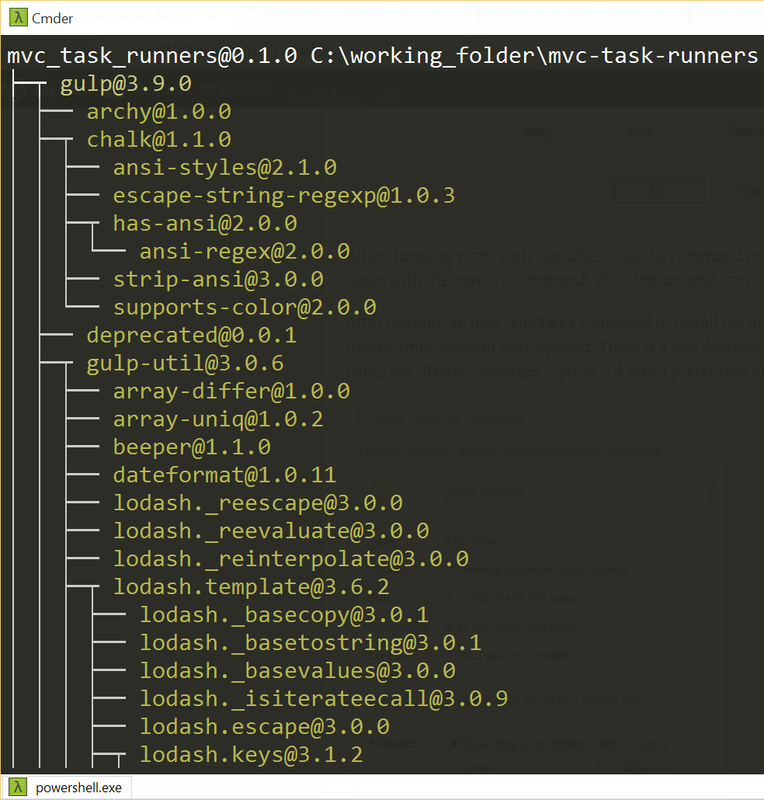 C:\oraclxe\app\oracle\diag\tnslr\user\listener\me.txt, In this “me” file will not be counted as 2 character but will be counted as number of characters in the path name. You can try GS Richcopy 360. I am currently using this software and it has worked for me and my enterprise to solve all our problems related to file copying. Try it, it helps. Long Path Tool! it works.